This Qoros Model K-EV Concept is a good reminder of why concept cars are awesome. They look absolutely insane and their performance figures are as well. How much of that actually makes it to production is anyone’s guess, but the fact remains that they are an exercise in imagination and creativity. We need more of that. It’s a fully electric concept that debuted at the Shanghai Auto Show. Qoros says that it’ll hit 62 mph from a standstill in just 2.6 seconds and has a range of over 300 miles. 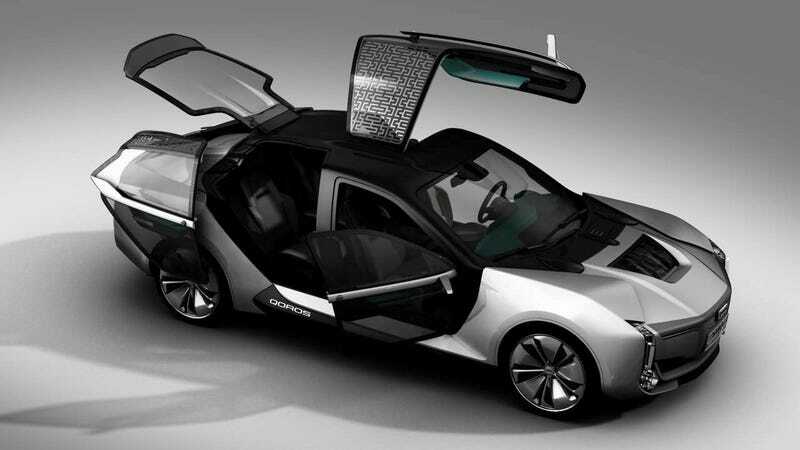 Asymmetric door designs—which include a gull-wing driver’s side door and a sliding rear passenger door—give it that awesome concepty flair. The cabin is made primarily from carbon fiber, making the body very light. The K-EV has four electric motors that make a combined 870 horsepower, reports Car and Driver. The magazine notes that top speed is a governed 162 mph and that the car can be charged either through a traditional plug or via inductive charging. It’s very clear that this car, if its market launch planned for 2019 is to be believed, will be a Tesla competitor. And while some car designers are going completely creaseless in their future designs, the Model K-EV seems to be made of nothing but creases. It’s a very ‘70s and wedge-y aesthetic language. I dig.